The Grounds of Alexandria love a themed make-over. 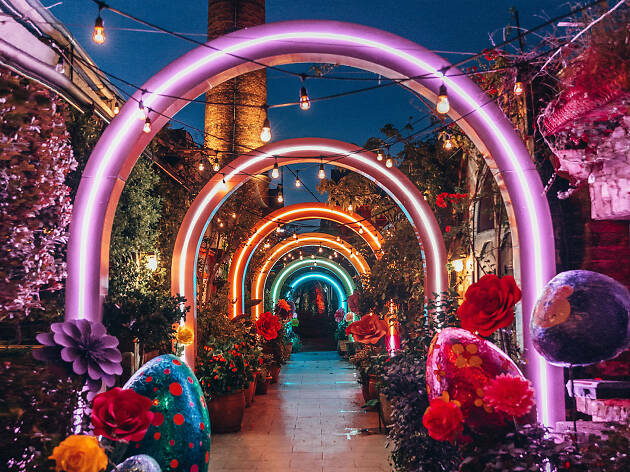 Their sprawling gardens and cobbled lanes seem to constantly get updated with Disney take-overs and fairy’s grottos, but they pull out the big decorating glue guns for Easter. The chocolate-focused long weekend is just too sweet an opportunity to pass up, and this year they’re focusing on the most important meal of the long weekend: dessert. 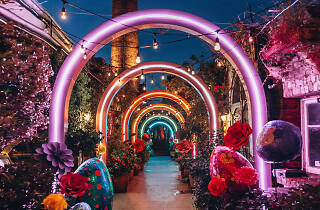 Rainbow Dessert Lane will present some of the Grounds’ favourite sweet treats – house-made doughnuts, gelato sandwiches and the deep-fried goodness of churros and ricotta and lemon beignets – under a colourful glowing canopy. The dessert carts will set up from 6pm under the glowing rainbow arch with Easter egg pylons on Fridays for the rest of the month. There’ll also be other festive activities at the Grounds, like the giant Easter egg cracking on April 21 and family brunches over the Easter long weekend.